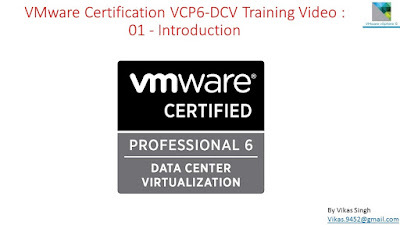 VMware Certification VCP6.5 DCV Video Training By Vikas Singh. This Is Introduction Video of VMware VCP 6.5 Vsphere Training Step By Step. This VMware Vsphere Video Training Course By Vikas Singh. In This Me Will Cover Core Topics Of Installing, Managing And Administering A Virtualized Data Center Using VMware Vsphere V 6.5. In This Video Training, You Will Get The Topics You Need For Success In Installing, Managing And Administering A Vsphere 6.0 Infrastructure.